Fortunately for the blog, though, Anna of Talliaferro was kind enough to invite me to dinner!!! I had the most wonderful time! It was fantastic to finally meet in person! And I got to look at ALL of her embroidery 🙂 Aren’t you so jealous? I asked for advice on one of the most irritating problems in embroidery for me: how to transfer a design to the fabric. She recommends high quality artist’s tracing paper. It’s carbon paper, but if you get it from an art supply store for professional artists (not advertised for embroiderers) instead of a craft store, it’s higher quality and generally works a whole lot better than the stuff usually advertised for embroidery. And this is La Serenissima, which is the next design in line to be released! Isn’t it gorgeous? Really, the photo doesn’t do it justice. This entry was posted in Crewel and tagged crewel, Talliaferro. Bookmark the permalink. Oh my word. What a blessing. Congratulations. Congratulations on your Honorable Mention, Hannah! You can be justifiably proud of your efforts. And yes, would so love to have had the opportunity to make a third at dinner with you and Anna in her home. La Serenissima looks luscious. Just ordered her “Pomegranate Sampler” that I’m planning to dive into soon. And again, “Huzzah” for your HM. Congratulations on the Honourable Mention. It sounds like a wonderful evening with a like mind! Wow I am in awe. What a awesome time for you. Congrat’s on the Honorable Mention. I would have love to be the mouse in your pocket at dinner. Did you get any good tips? 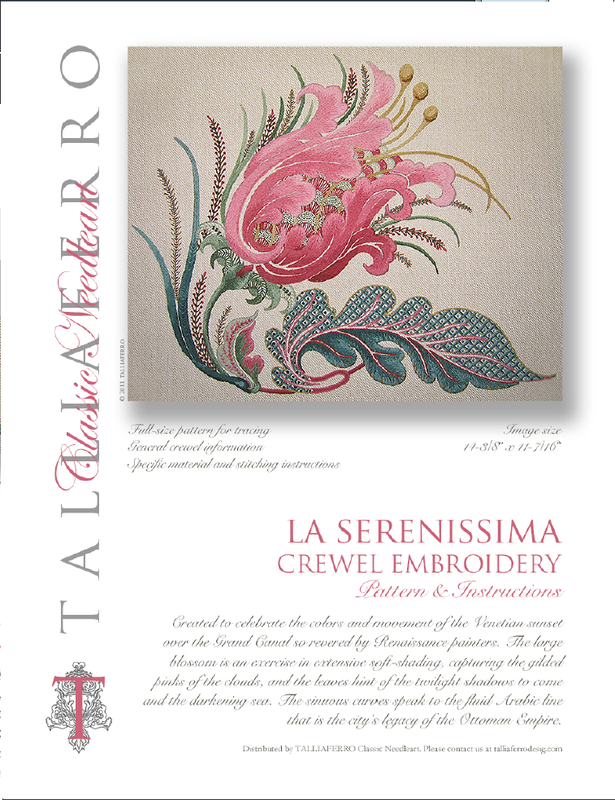 How about a peek at the color list for that La Serenissima design lol. Would love to get a jump on ordering the Appleton yarn. Last time I ordered the yarn for the Royal Persian Blossom some orders were sold out but most due unforeseen circumstances ( death of the yarn Dyer of that color). But her wonderful designs do go fast. Glad you make it home safe and sound ;). You could email her – maybe she would give you the list 🙂 She’s really nice. I am going to try the tracing-paper-tip out next time I do a design transfer. Wow… What a trip! Congrats on the honorable mention. I have yet to try one of Talliafero’s designs, but it’s on my list. I have a few of the Crewel Work Company ones to do up first. Oh, Lucky You and ConGraTuLations! Also, thanks for the tip on the artist’s tracing paper. I was just about to buy the regular type – brilliant timing. That was sooo pretty. I too need to embroider more. I loved it but now my time is so short. I love how you fill in areas. I dont know how to do that so good. That must have been a fun time. I should look up area shows and see if we have it in this area. Congratulations on the honorable mention Hannah!